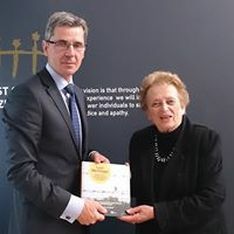 Within New Zealand and wider Australasia, HCNZ plays a vital role in Holocaust education and remembrance, and a growing contribution to the discussion of human rights in the region. Financial support (either in the form of an annual allocation or grant) or a one-off contribution. We understand that this form of support must be accountable and readily measurable, and offer relevant brand, product exposure and employee benefits for your organisation. Sarah Williams, officeadmin@holocaustcentre.org.nz or call (04) 801 9480.